Don't worry if you missed me at one of my events, you can still purchase some of those same great items here on our website. From time-to-time I need to trim down my stash. Items from my extra stash may also be listed below. The Mini Backpack is just the right size for the Toddler who needs to carry his own. The straps are centered in the back with a flap closure and a handle to carry the bag. The snap inside closure gives easy access to the things inside as well as holds the bag under the flap. The front and rear pockets can hold additional treasures. Small: 12" x 12" x 6"
Medium: 13" x 13" x 6"
The tote bags that I make are filled with pockets. The bags are made with cotton material and can be washed in your washing machine. I have made many custom bags to the specifications of the customer’s needs. The bottom is made with washable vinyl that can easily be wiped off if the bag had to be set down in a public place. The tote Bag Large is an all-purpose bag that can be used for so many different things. The size is great for an overnight bag, carry everything bag, and so much more. The open style features side pockets in the inside. The outside features end pockets that can hold a water bottle. The front pocket can hold smaller items as well as a front zipper pocket to secure those items that you need to zip in. The back features a long pocket as well as a luggage band. The bag is closed with an inset zipper top. 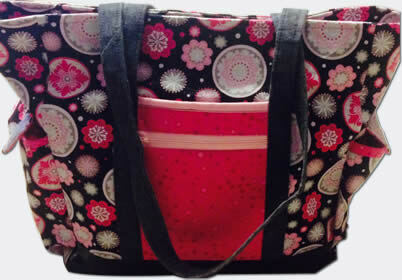 Size: The Tote Bag (Large) can be special ordered with a variety of pocket combinations made to your specifications. The Tote Bag (Large) TALL Bag is 2 inches taller and is a great crafting bag. With the open style in the inside, it will hold your yarn, craft project and so much more. The Side pockets are designed to carry your needles for knitting, hooks for crocheting and the back pockets can hold all your notions. The inside pockets help to organize your project and the zipper closure hold it all together for you. This overnight bag features handles and a shoulder strap to carry your belongings for the getaway. The zipper top closure and re-enforced bottom make for easy packing. There is an inside side pouch for smaller items and outside pockets for those extra things. To place an order from the following product list complete the form. Make sure to enter what you would like to order and the quantity of each item in the Ordering Instructions field. After placing your order we will contact you to confirm the order. We will email you a PayPal Invoice for payment. This can be paid for using a credit card or a PayPal Account.